Joanne Lee is an artist, writer and publisher of the Pam Flett Press, a serial publication essaying aspects of everyday life. Her work frequently investigates specific sites through writing and photography. Projects have included Vague terrain, an edition of the Pam Flett Press attending to edgelands and interstices; an audio-visual essay, The good place that is no place, which explored ideas of home, belonging, sanctuary and high rise living from the perspective of Grimsby’s East Marsh; General waste, a photographic series focusing on a variety of littered landscapes in Britain; and Neepsend sequence, which resulted from repeatedly walking Sheffield’s urban lanes. She is currently developing new work from Returns, a residency considering post-industrial landscapes in Stoke-on-Trent, which will be shown in the city’s Airspace Gallery in late 2018. Publications include ‘Vaguely Northern: In between in England’, a chapter for the book Northern Light: Landscape, Photography and Evocations of the North (Transcript Verlag, 2018) and ‘Force yourself to see more flatly: a photographic investigation of the infra-ordinary’ for Georges Perec’s Geographies; Perecquian Geographies (forthcoming, UCL Press) She is Senior Lecturer at Sheffield Institute of Arts. 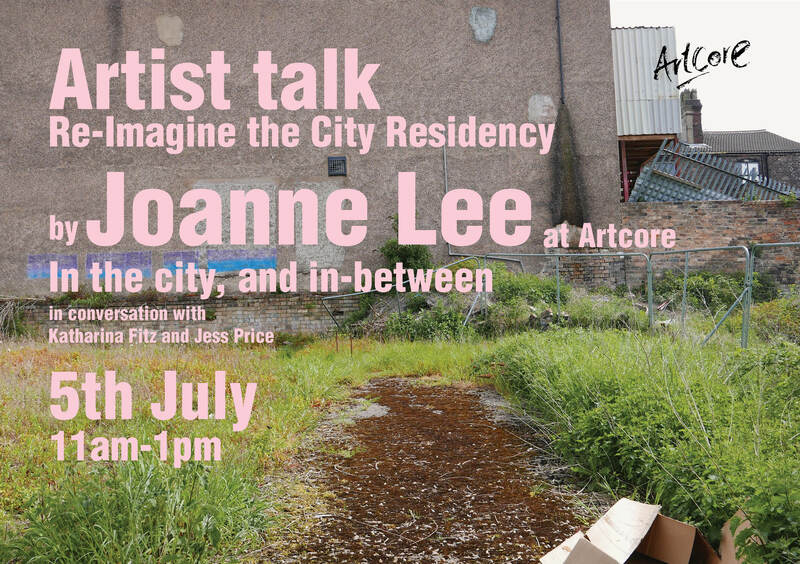 For this event Joanne Lee will be in conversation with Katharina Fitz and Jess Price, two artists in residence for Re-Imagine the city. Join us on the 5th July at Artcore 11am-1pm. Free. To confirm your attendance please RSPV to chiara@artcoreuk.com. Artist Talks are part of Artcore residency programme throughout the 2018-2019 .